This rattle is great! My daughter loves it. 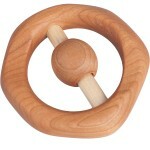 The sound it makes is nice too… a good wooden pop sound as opposed to the loud annoying sound in most rattles. Also, one can see where the sound is coming from! In an enclosed rattle there is not the opportunity to observe cause and effect like with this one. She slides the wood bead slowly and then quickly to see when the sound happens.